﻿I was in Nova Scotia just a few days (Hans longer) when we made the decision to fly to Ottawa to visit Heiko and family. 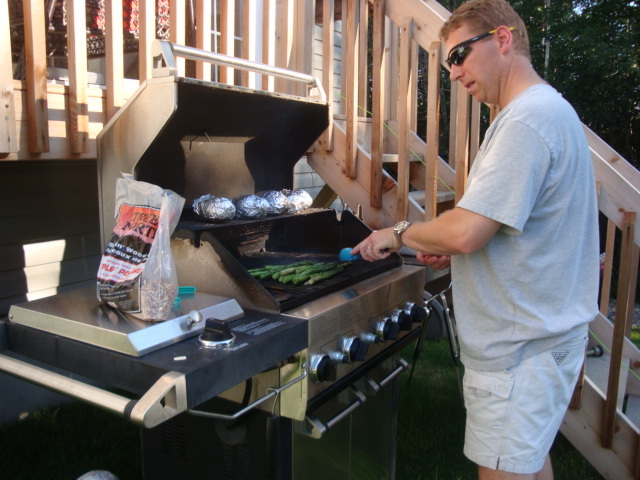 Heiko, Heather and Natasha were in a new house, one we hadn't yet seen; we also hadn't seen them for quite a while. So though our time was fleeting, this was a priority for us this year. 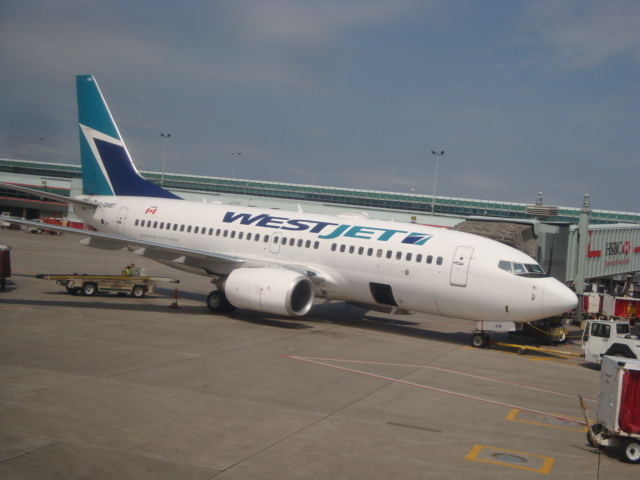 Heiko is a pilot with West Jet and he told us that he would be flying the plane from Toronto to Ottawa on the day we were going. 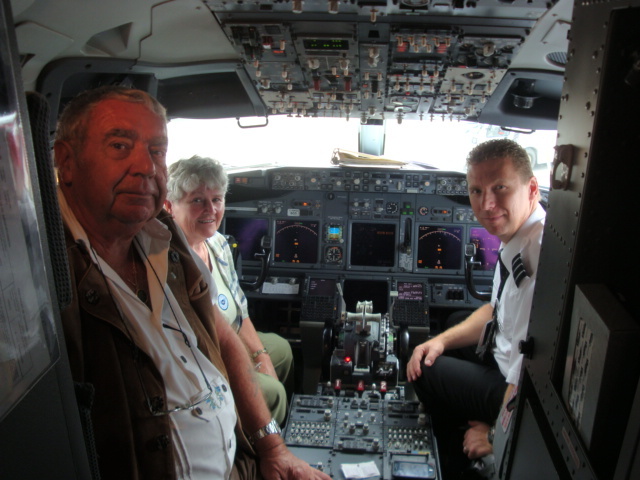 This would be Hans' first time to fly with his son as the pilot. Mine, too. 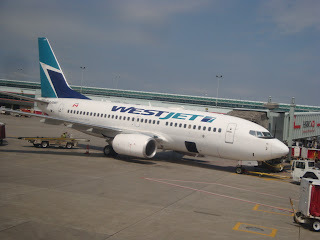 The plane below was the one we boarded for Ottawa. ﻿Heiko met us upon our arrival in Toronto and accompanied us to our gate. There we met the crew that would be flying with Heiko, including Brad, the captain. 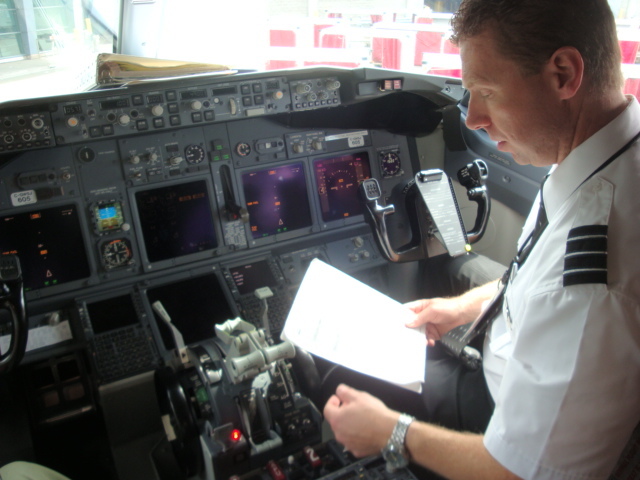 Heiko is First Officer and on this trip he would be doing the piloting. 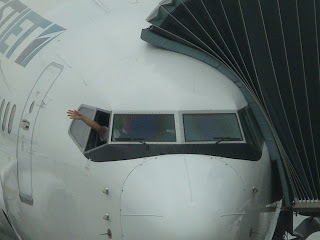 As we were early, he took us into the cockpit, explaining some of the complicated buttons and devices. What was surprising is how small a cockpit actually is: seats for the pilot and co-pilot and one seat behind, with barely room to move. Once the aircraft is ready for take-off, the bomb-proof door into the cockpit is locked and sealed off. Shortly before take-off, Heiko gave the introduction to the passengers over the intercom. 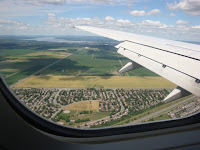 He surprised us by saying at the end of his short welcome, "As my folks are on board today, I guess the onus is on me to make a smooth landing! And that he certainly did, with everyone clapping approval--a proud moment for Hans and ﻿me. 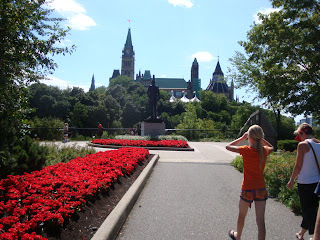 As we were to be in the Ottawa area for less than a week, we spent most of the next few days sightseeing. 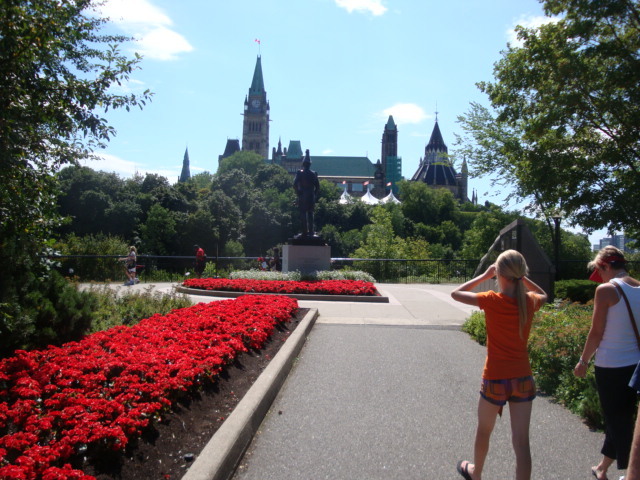 Both of us had been to Ottawa before, but neither of us knew it well. 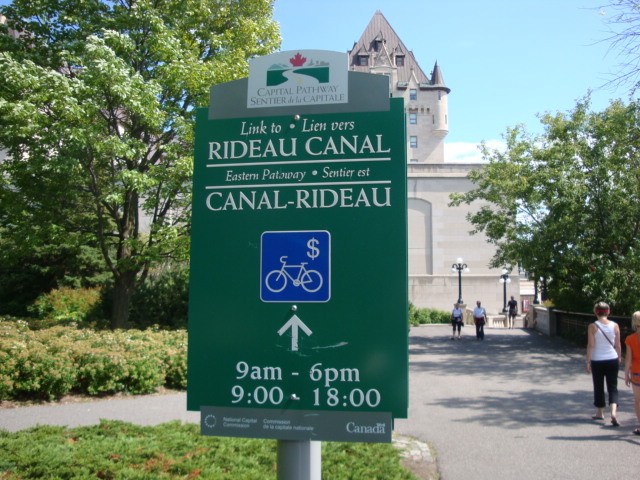 It is a beautiful city with its downtown centre ideal for walkers. 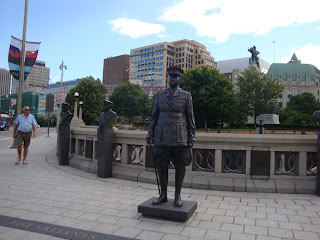 Hans walking along in downtown Ottawa; not far from there, the Lord Elgin Hotel and passers-by. 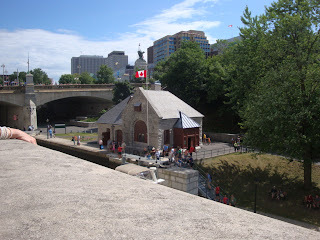 We five wandered along the canal, where the locks are still manually opened for the many boats going through by turning a crank by hand. The park and walkway are pristine and manicured, with flowers and trees everywhere. 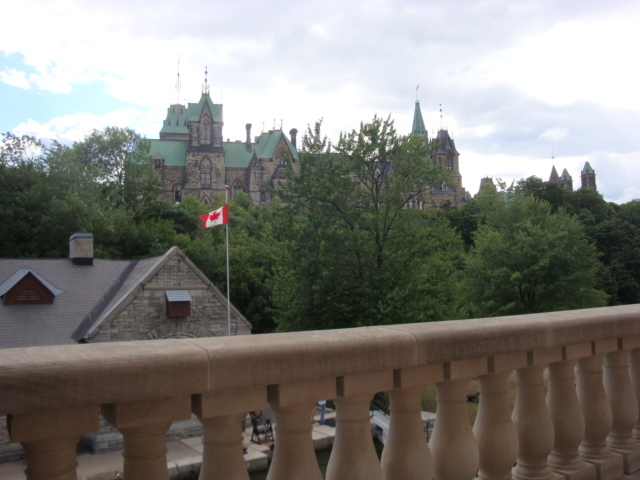 The Parliament buildings and towers can be seen from afar and no matter where we were, walking downtown or driving at a distance, they filled the skyline. 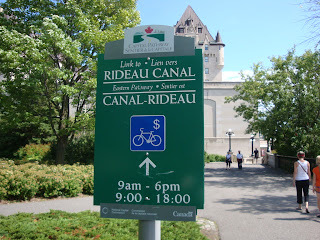 The picture below shows the canal and locks. ﻿﻿﻿During our stroll around the centre of the city, we passed a market that was flourishing and several pubs, one of which we stopped at for refreshment. 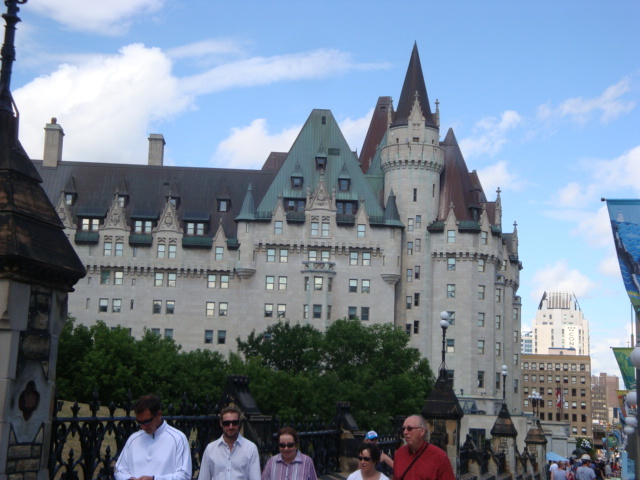 Two pictures outside D'Arcy McGee's Pub in downtown Ottawa: Hans above and Heather, Heiko, Natasha and I in the picture below. 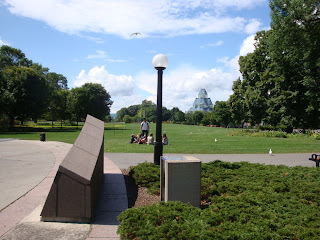 It was a beautiful sunny day, not too hot and not humid. 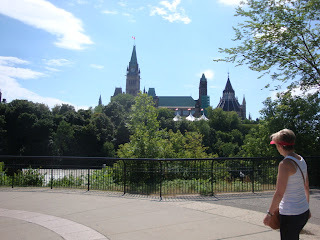 We were fortunate as Ottawa can have very humid summer days. 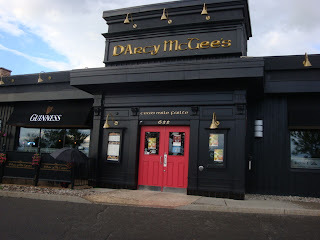 ﻿On the way home, we stopped for supper at D'Arcy McGee's Pub in Kanata. The place was almost full with people celebrating after a golf tournament. I ordered Yorkshire pudding filled with a concoction of cheese, mushrooms and, I think, potatoes. It was tasty but not memorable. 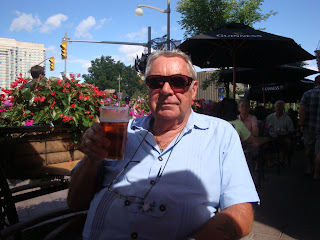 The pub itself was very nice with an old-country atmosphere. It reminded me of pubs we had visited in England. The noise level, however, was something else due to the busy evening. On our second last morning, Hans and I drove to Carp, a small, picturesque town north of Stittsville, where the Diefenbunker--Canada-s Cold War Museum--is located. 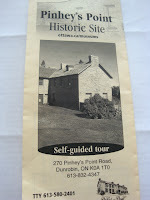 We didn't go in, just checked it out and continued on our way. It was pleasant driving along the country roads after being on so many four-lane highways in the area. Later that same day, the five of us drove out to visit the Historic Site, Pinhey's Point, which isn't far from Carp. 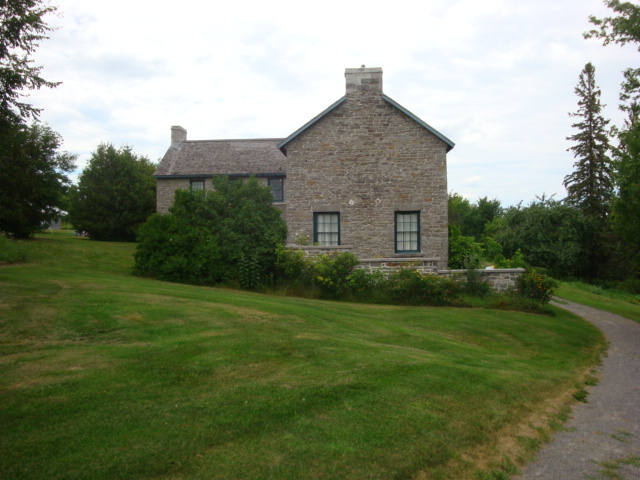 As the brochure guide to Pinhey's Point says, the gentleman who built it, Hamnett Kirkes Pinhey (1784-1857), had an eye for beauty when he selected the site of his 800-acre land grant. 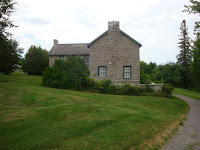 He built the house in four stages between 1820 and 1849. 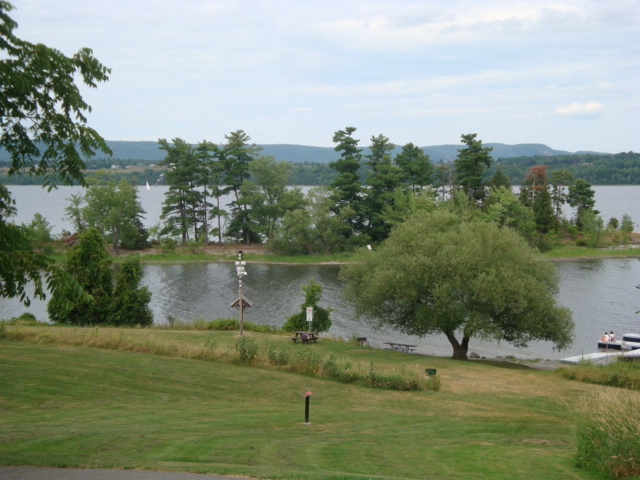 The property overlooks the Ottawa River, a stunning location. The house looks small but is actually quite large inside. Entrance is free. The only friend we managed to see was Mike Hewes. 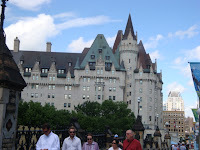 We made a quick trip to Chelsea, Quebec, across the river from Ottawa, on our last morning. He and Hans had worked together at Canadian Forces Europe Headquarters for several years. 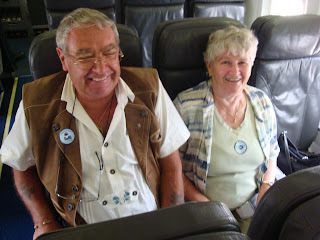 In June this year, he and Brenda had visited us in Germany. 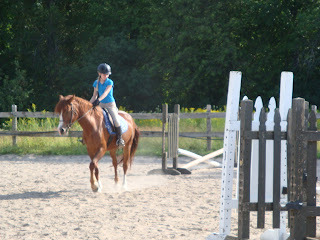 On our last afternoon, we went out to the horse stables to watch our granddaughter Natasha ride. She is just 11 and a half, but she's been taking riding lessons for four years. 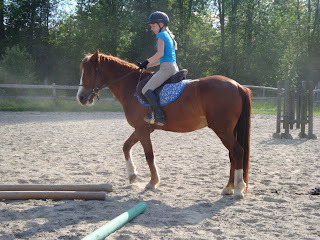 She loves all animals, especially horses and her dog Cody. She hopes to be a veterinarian someday. We were certainly proud of the ability she demonstrated that day. 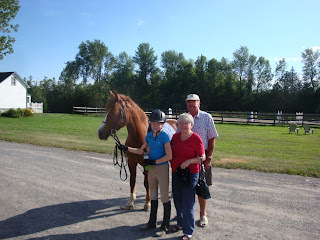 The proud grandparents below with Natasha and her horse. Our visit was brief with not enough time to get in touch with others or to take in other points of interest in the Ottawa area. We'll do that next time. 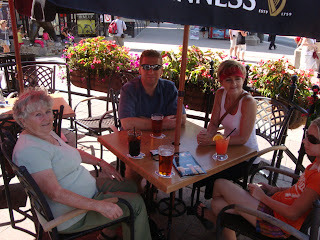 On this trip, the family came first, as it should. On our last evening we enjoyed a barbecue at home, with Heiko doing the barbecuing. One has to look closely, but that is Heiko's arm below waving out the cockpit window. 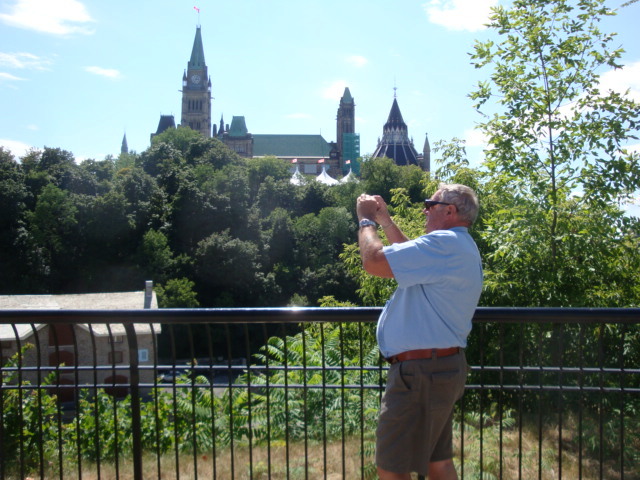 He left for Winnipeg before our flight left for Halifax, the perfect "Aufwiedersehen."